Unlike other pattern recognition indicators, this indicator utilizes polynomials to not only identify patterns currently forming in the market, but also to analyze historical data to see how the market is likely to behave after the pattern occurs. Customize number of forecasts, forecast length, and much more. 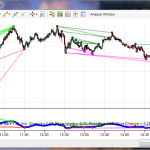 This very unique product is unlike any other NinjaTrader indicators available. Other NinjaTrader indicators simply react to price movements. Our Polynomial Forecasting and Pattern Recognition Indicator calculates the best fit polynomial for the most recent market pattern, and identifies where similar patterns have occured in history. In other words, it is performing pattern recognition utilizing polynomials. Once the patterns have been identified historically, a polynomial is calculated to define the market activity for the market price after that pattern occured. Those historical patterns are then used as a forecast for the current market price. Therefore, our forecasts are based completely on historical price patterns. For additional information on our Pattern Recognition Indicator, please refer to our Users Guide. 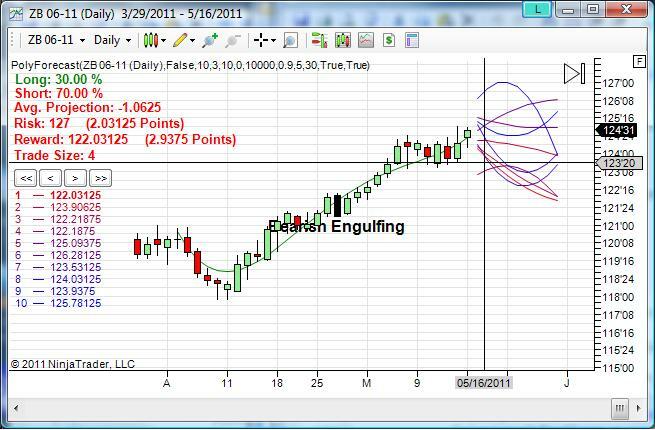 Purchase our Polynomial Pattern Recognition indicator by clicking the button below. NO REFUNDS. ALL SALES ARE FINAL!!! Do you have an instruction manual with this indicator. As you being the developer, what is the best default values for Forecast Bars? Forecast Degree? Forecast Lines? Poly Degrees? and Poly Length? Thank you. There is a users guide located in the post above located under the “More Information” heading. The “best” values are going to vary depending on the market, time frame, etc. that you are trading. Typically I find that the indicator is more accurate when forecasting a shorter number of bars (i.e. setting the ForecastBars to a lower number generally yields better signals). Thank you for the prompt reply. I will view the user guide. In the meantime, I am purchasing your backtest software. It looks great. Hi Mike, I’m having trouble purchasing this pattern recognition tool. I’ve clicked the “add to cart” button and then gone to my cart but can not see any items available for purchase. What should I do to complete the purchase of this tool? Also is there a chance I could see it operating via a Skype session? You can use the link below to purchase the indicator if you are having difficulty. Thanks for that. Also just wondering if before I purchase would it be possible to arrange a Skype session wherein I’m able to view the indicator operating live?